I LOVE the Outlander series. LOVE. Love as in it's my favorite series of all time, followed by a tie between books by Sharon Kay Penman (The Welsh trilogy, The Henry the II trilogy, and Sunne in Splendor), and of course, Harry Potter. I didn't even have to put a link on Harry Potter because EVERYONE has heard of Harry Potter. I immediately was intrigued because it was nice and thick -- my kind of book. And the crown on the front surely meant historical fiction -- also my kind of book. So I flipped it over and started reading about it. And I almost left it on the table. See, it involved time travel, and I'm not so down with that. But I kept coming back around the table to that book, and at the last minute, I snatched it and carried it home. And life has never been quite the same. To make it quick, she's a war nurse with her husband in Scotland in 1945. She touches a cairn stone and whoomp, is somehow transported 200 years back, and has no idea how, why, or how to get back. So she has to set about getting used to it. There are wars, narrow escapes, love, hate, intrigues, conspiracies -- terrific book. And the series goes on for six books, and I was fortunate enough to come across them when all six were published. 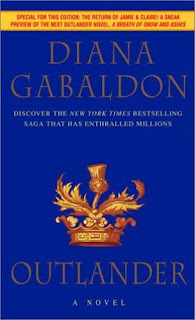 As large as these books are, and as incredibly as they're researched, it takes Diana Gabaldon about two years between books. I thought the sixth book was the last one. There's another one due in September! And rumor of another! Needless to say, I pre-ordered that baby as soon as it was available. If you love historical fiction -- if you love a good love story without drivel -- if you love action -- if you like a really thick book (and a stack of them!) to read -- try this series out. Then let me know what you think! Get the An Echo in the Bone Countdown widget and many other great free widgets at Widgetbox! I love those books! Love, love, love!!! Thanks for the heads-up on the new one...heading off to Amazon to pre-order it! OMG! I adore these books, have read them over and over and over, even have a signed copy of the Outlandish Companion. I. cannot. wait. You got me hooked on these books and I've already put the latest on hold at the library. Oh yeah, I'm right there with you! 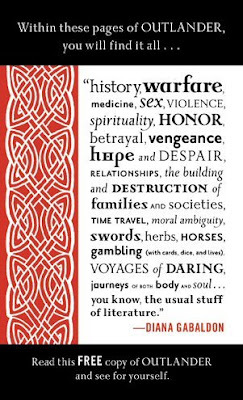 A friend recommended Outlander to me way back when and I read the first three! I loved 1 and 2 but by 3 it was getting just a little bit too Scottish history for me. But 1 was the BEST -- Jaimie -- swoon! Laurie, you should keep at it -- they end up going elsewhere and the Scottish history starts to fade out! WOW, Christine, that's cool! I have an autographed copy of one of the Lord John books that a friend gave me (thank you, Lisa!) -- she lives near The Poisoned Pen and scored it. I did send away for the signed book plates -- did you see on Diana's web site that you can do that? Okay you sold me! I'm going to head over to the library to pick up the first book. Can't wait! I will have to check it out...thank you for visiting me so often..
Just watched all 3 Lord of the Rings movies to go with the Faerie Festival I was at. PS...I have had the good fortune of visiting Scotland several times.